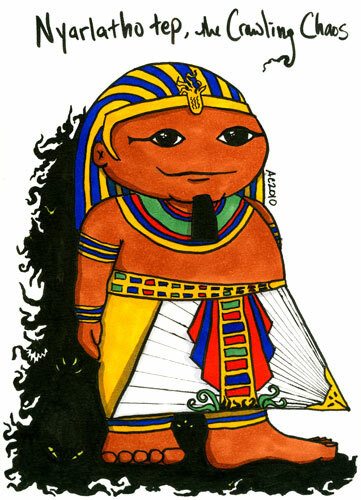 Adding another weeble to my depictions of the mythos of HP Lovecraft, I give you Nyarlathotep. He appears at least twice as a handsome, charismatic Pharaoh gathering armies for the Great Old Ones. He’s also known as the Crawling Chaos, and he shows up in a few other, less palatable forms, in other stories. I had fun drawing his creepy-crawly shadow, not to mention the sneaky monsterified details on his otherwise traditional costume. Nyarlathotep, the Crawling Chaos, 5″x7″ pen, ink and Copic marker on paper.